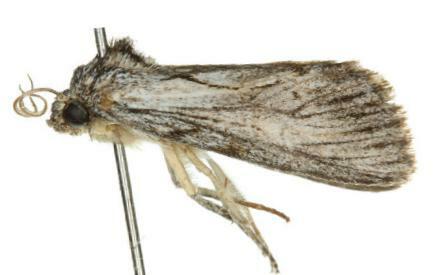 The adult moth of this species has or grey or brown forewings, each with a pattern of dark lines by the hind margin. The hindwings are plain pale grey or brown, with dark veins. The wingspan is about 3 cms. Volume 8 (1909), p. 182, No. 3785, and also Plate 127, fig. 17.